A woman wants to know how to help postnatal depression. "My husband thinks my postnatal depression isn't real." 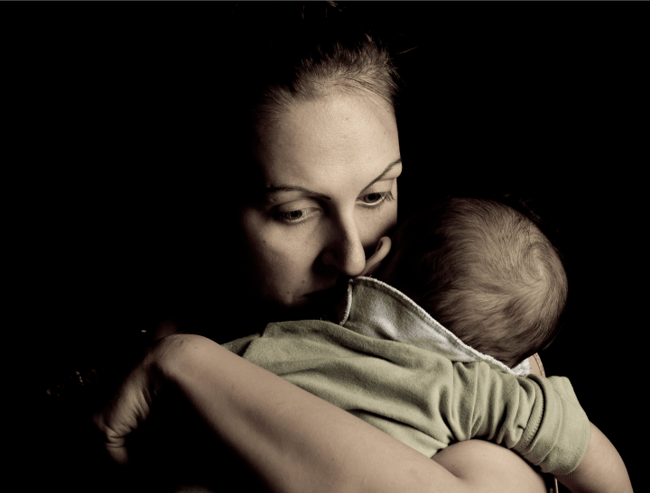 A woman had her first baby nine months ago, she has been suffering with postnatal depression (PND) since. “It will get a little better, then worse. Then a little better, then worse. Repeat,” Reddit user PPDnohelp said. The 29-year-old believes she is suffering from PND, but her husband, 31 doesn’t believe her. She says that in the past two weeks she has been on a downward spiral. “I feel like crying all the time, and do several times a day. I can’t sleep without taking something. I rarely even get dressed anymore,” she wrote. After her PND got worse, the woman’s husband confronted her about it. When she told him that her depression was putting her in a really bad place, he told her that she had nothing to be depressed about. He pointed out that there are homeless people in the world, people with cancer and people starving. Her husband believed she just needed to change her attitude and simply ‘stop being depressed’. Apparently I needed to just stop being depressed. Image via iStock. When the depressed new mum told her husband she may need to see someone about her condition, and perhaps try medication he disagreed. He argued that that&apos;s what &apos;big pharma companies want you to think&apos;; calling doctors &apos;pill pushers&apos; and repeated that all his wife needed to do was change her attitude. The wife wants to go and see someone professional. But it&apos;s not an option. She has no health insurance or income of her own. Her husband says he can&apos;t afford to put her on his health insurance. Because of his wage, she doesn&apos;t qualify for reduced rates. So she believes that seeking medical help is not an option for her. "Does anyone know of any other way I might be able to get help?" she asked Reddit. "My husband basically doesn&apos;t believe my depression is real, and doesn&apos;t believe in medicating it. He is the sole earner and I have no income of my own, plus no insurance, so I can&apos;t just do it on my own without him paying for it, and he won&apos;t."
Her husband won&apos;t help her. Image via iStock. The distraught mother then makes it clear that she is not having thoughts of harming her child, she just wants help to get herself out of the dark place she is in. "I do want to make it clear I am not having thoughts of harming my child - I would never hurt her," she says. "Also, "just leave" is not an option. I have no money. This is a bad situation but I don&apos;t think taking my infant daughter to a shelter is better right now."